Recently, City West Water and Programmed launched a joint 12- week program where cadets were able to gain practical experience in the water industry. The program presented a great opportunity for cadets to learn water industry operations and work alongside water industry professionals to learn how a network like City West Water’s is maintained. What has been the biggest reward so far? 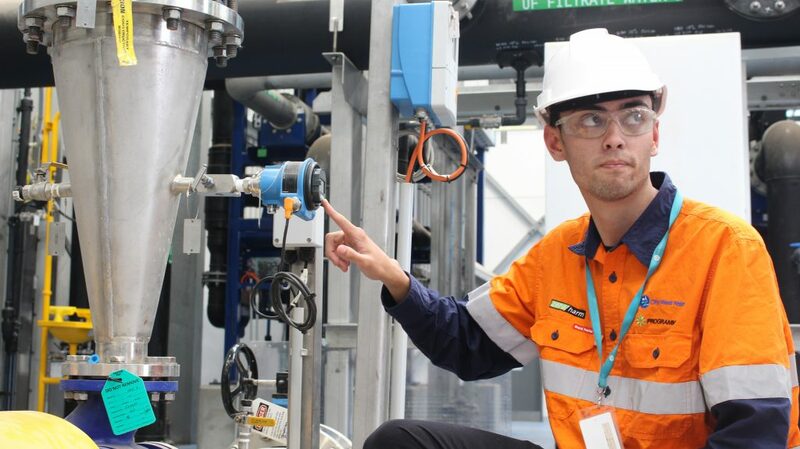 The cadetship has been a great opportunity to learn about the water industry and I have learnt about the various roles and divisions in the industry, and it has given me the ability to think about areas in which I’d like to work. “It’s important to listen and take the advice from supervisors and operators and to keep an open mind,” says Chris. Did any part of the training surprise you? Even though I have my Confined Space/White Card, I was surprised by how comprehensive the safety procedures are. I have had good training and instructors explain the important parts of safety, but seeing it implemented helped me appreciate that those procedures are there to prevent accidents. Is there a particular area you are interested in after the cadetship? Definitely – Water Operations is really interesting. I never knew about the sizes and types of mains in the city and outer suburbs or the water quality monitoring that occurs every day. It’s all quite new to me and very interesting. Has there been a highlight for you? I have enjoyed being able to see the different areas of water maintenance from going out on training trips with different supervisors and water crews. I have had the opportunity while on jobs to ask questions, and the crew always take the time to answer the questions using first-hand experiences and give proper examples. The crews helped me wrap my head around the works and supported me to work through a solution. Do you have any advice for others who may be interested in a cadetship? I would tell anyone interested in a cadetship to ask a lot of questions and write down information that is of interest to you. It’s important to listen and take the advice from supervisors and operators and keep an open mind. What are you looking forward to in the next stage of your traineeship? I’m ready to start working and getting more in-depth experience in the various areas of water operations. The cadetship gave me a wide variety of hands on (practical) and theoretical experience. I learned about why we complete the jobs the way we do, and I’m ready to continue learning.